﻿The new unit replicates a complete amp signal path—not only the preamp, but also the power amp containing phase inverter, push-pull stage, and output transformer simulation—resulting in a pedal that not only sounds but also behaves like a real amp. The pedal’s pre boost has the capability of pushing 13dB, adding a nice amount of gain, while the fuzz is designed to work like a vintage germanium stage. There’s also a switch for two different character voicings: tighter bass and slightly compressed tone on the left, and looser bass, including maximum dynamics, on the right. 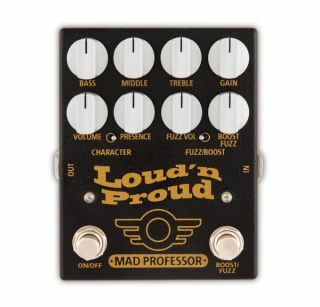 Mad Professor touts the Loud ‘n Proud as offering the “classic and rebellious rock tone” of bands and artists like AC/DC, Cream, Jimi Hendrix, Led Zeppelin, Free, Yngwie Malmsteen, among others. For more information, head over to Mad Professor Amplification.